What screenshot? The one from my post? What is on the bottom there, is a transfer queue. That has nothing to do with command-line. You do not need that. Please kindly excuse me for asking newbee questions. 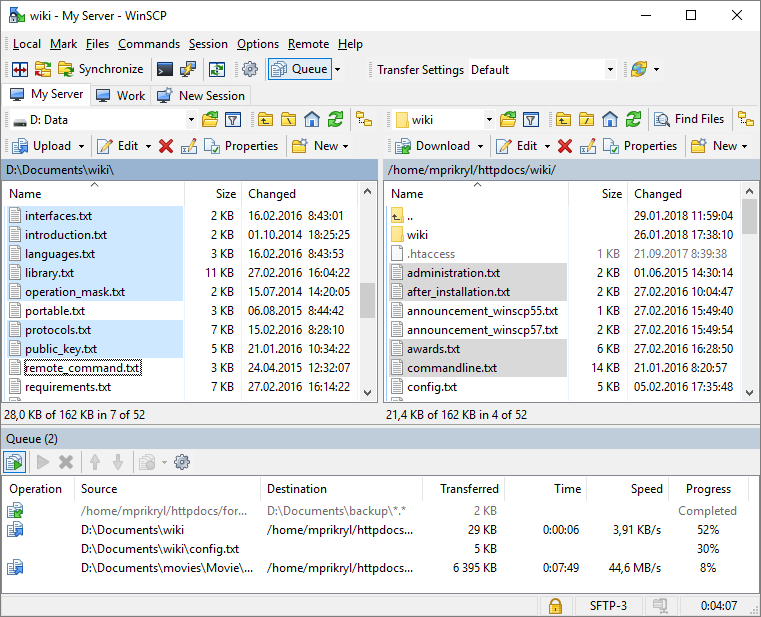 My problem is essentially: how could I, starting from a normal window of WinSCP, enter an FTP command, i.e. which button I must first click on in the normal window in order that I could obtain a tiny window in which I cound enter an FTP command? Ctrl + Shift + N show the command line. But neither of these allow the entering of FTP commands I think, they are for shell commands. Maybe if you change the advanced connect properties to use another shell. @Pathduck: But what if I want e.g. to create a directory on the remote site? Why do you want to type a command to create a directory? Use Files > New > Directory. Or are you actually trying to automate something? Do you want to write a script? Maybe you should actually explain us your overall task, rather than asking for tiny details. Because chances are, that you are on a completely wrong track.